Learn about the history of Kaywoodie! Kaywoodie is the name of a pipe fashioned by the Kaufman Brothers and Bondy Company, back in February 1919. Its popularity caught on, and soon the company changed its name to Kaywoodie, wanting to be recognized by the name of the item that led them to success. 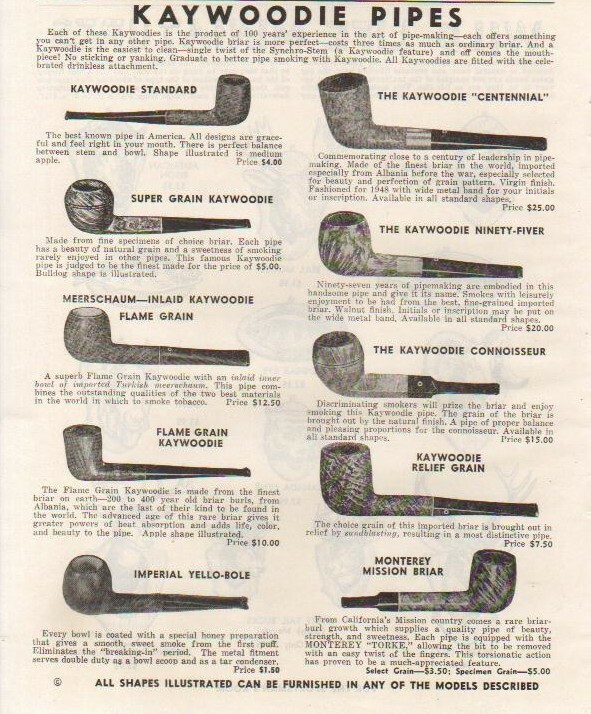 The Kaywoodie name was since used to begin a broad line of tobacco pipes. The origin of the name Kaywoodie has been derived from the K in Kaufman, and wood after the briar wood which is used to create the pipes. The company was started back in 1851 by the Kaufman brothers from Germany, in the Bowery section of New York City in the form of a small shop, whose backroom served as the craft room where they created all of their pipes. The business soon branched out to the golden coast during the big gold rush, as the businessmen involved took a large supply of Kaywoodie Pipes all the way to California which he sold along the way of his trip. This was Kaywoodie’s earliest national distribution, and it added a lot of credibility to the KBB reputation. By the time the 1800’s were drawing to a close, KBB had expanded to Chicago, Atlanta, San Francisco and St. Louis. Most of the company’s agents were a close knit group of family and friends. The Kaywoodie pipes soon started coming embossed with the emblem of an inlaid cloverleaf and a cloverleaf with the KBB initials etched inside which served as a trademark for all Kaywoodie pipes from 1881. Towards the turn of the century KBB’s pipes had received worldwide acclaim and were highly demanded towards the end of the century. The early Kaywoodie pipes were called Drinkless Kaywoodies which had push-bit stems initially, but the design was revised to include a synchronized stem later to provide a better smoking experience. This included the threaded Drinkless screw-in mouthpiece for the pipes, which was unique for its generation. Kaywoodie pipes focus on offering its users a high quality pipe, which is affordable to the average pipe smoker. All Kaywoodie pipes vary to some degree as they have various features such as paper filters, screw mounted metal filaments, aluminum scoops and plain push bits, which cater to every taste of the different consumers. Kaywoodie has been heartened by the recent resurgence in the pipe market and is now targeting its pipes towards lawyers and politicians, a demographic which is fitting enough for this quality brand.